3 It is evident that mental arithmetic is not practised in today's education system to the extent that it was many years ago. Perhaps this is not completely surprising with the widespread use of calculators and computers, nevertheless, the punching of a calculation into a handheld calculator does not do much to stimulate the brain cells. Several years ago children would learn their multiplication tables so well off by heart that they could give the answer to sums such as 7 multiplied by 8 or 6 multiplied by 9 almost without thinking, but sadly this is not the case today. However, we still believe that mental arithmetic is still a valuable asset to have at one's disposal and it is also an excellent way of exercising the brain and keeping your mind alert. The following is a mental arithmetic speed test of 30 questions which gradually increase in difficulty as the test progresses. Only the answer must be committed to paper, and, of course, the use of calculators is not permitted. You should work quickly and calmly and try to think at all times of the quickest and most efficient way of solving the questions. As well as agility of mind this is also a test of your ingenuity as there are short cuts to arriving at the correct solution for many of these calculations. You have 45 minutes in which to solve the 30 questions. What is 7 multiplied by 12? What is 144 divided by 3? What is 11 multiplied by 13? What is 70% expressed as a fraction? Multiply 8 by 7 and divide by 4. Divide 63 by 9 and add 15. What is 20% of 60 divided by 3? What is *h of 620? What is 7b of 96 plus 17? Multiply 7 by 3 by 4. Divide 156 by 13 and add 72 multiplied by 3. What is 9 multiplied by 4 multiplied by 3? What is 40% of 120 multiplied by 4? Add 15 + 19 + 7 + 3 + 14. Multiply 3 x 16 and add 43. What is 1k of 56? Which is the greatest, 70% of 140 or 45% of 200? Add 3/4 of 36 to 2/5 of 25. What is 60% of 550? Subtract 864 from 1296 and multiply by 2. Subtract % of 95 from 3/4 of 160. (xxviii) Add 30% of 270 to % of 81. Add 7 + 58 + 27 and divide by 4 + 39 + 3. 4 In this test we are testing your ability to juggle with words and fit them into an interlocking grid. You must place all the words in the crossword within 30 minutes to satisfactorily complete the task. Now arrange the letters in reverse alphabetical order, followed by the numbers in ascending numerical order. Now arrange the letters in reverse alphabetical order, followed by the numbers in descending order. Now arrange the letters in forward vowel alphabetical order, then consonants in reverse alphabetical order, followed by numbers in ascending numerical order. Now arrange the consonants in forward alphabetical order, followed by the odd numbers in descending numerical order, followed by the vowels in reverse alphabetical order, followed by the even numbers in ascending numerical order. 6 Look at each set of 7 letters in turn for just 5 seconds, then look away and try to solve the anagram within 2 minutes without committing anything to paper. 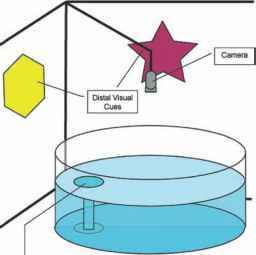 This test is designed both to test and develop your powers of memory and your verbal dexterity. To solve each anagram you must first memorise each set of 7 letters and then use these 7 letters to produce a 7-letter English word. 7 Words are like leaves; and where they most abound, much fruit of sense beneath is rarely found. People delight in playing with words - pulling words apart, reconstructing them in different guises, arranging them in clever patterns and finding hidden meanings within them. It is often said that to have a mastery of words is to have the ability to produce order out of chaos and that a command of vocabulary is a true measure of intelligence. As such, vocabulary tests are widely used in intelligence testing. In this section we exercise your word power and agility of mind in restoring order from the chaos we have created in a variety of 6 different types of word puzzles. Each of the puzzles vary in difficulty, and to enable you to monitor your performance in finding a solution we have indicated a time limit for each puzzle. If, however, you cannot solve the puzzle within the set time limit, this is no cause for despondency. Instead you should persevere and attempt to solve the puzzle in your own time. The main purpose of the puzzles in this sub-section is to entertain and intrigue you, and to give your brain a thorough work-out. 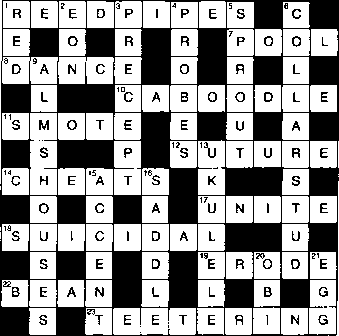 (i) Find the answers in the crossword above, to solve these 16 cryptic clues. A Pay American money into your account, and speak with a dialect B Is a lucid thought 'take one's life'. C Blunt-edged surgical instruments. D Walking the tightrope. E Ring the deer to wear away. Musical instruments on the river bank. Hit by tomes. Don't slam the door on these charity abodes. Vegetable that will shoot forth. J Lad named Des, places this on his horse. K West Indian sorcery found in the Gobi desert. M Urge a hen to produce a spheroid. N Give a sachet to the dishonest people. O A game played in the water. P Get caned and slide around the ballroom. (ii) All of the vowels have been removed from this saying. Replace them to find the saying. 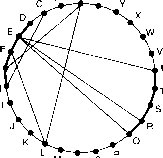 Trace the letters across the chords and around the circumference to find two words which form a familiar phrase. However, if the next letter is 1-4 letters away from the previous one in the alphabet, then trace around the circumference rather than across the chords. 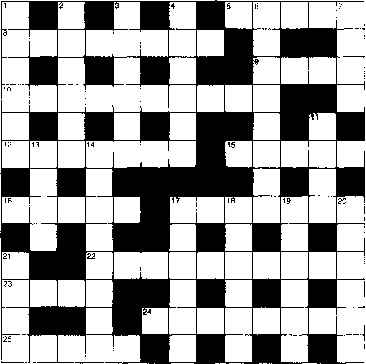 (iv) Place the 26 letters of the alphabet in the grid to complete the crossword. Seven letters are already in place and one clue is given. The four six-letter words have been jumbled - solve the four anagrams of computer terms and write the answers in the adjacent spaces. Transfer the arrowed letters to the key anagram and solve the fifth anagram, which is a computer term. (vi) Each set of 9 squares can be arranged to form a 9-letter word. These are their meanings, not in order.